Last week I mentioned those beaded purple and gold stars in the top left container. Well, blogging about them was enough motivation to work on it more. I tripled the length of the herringbone lariat rope! 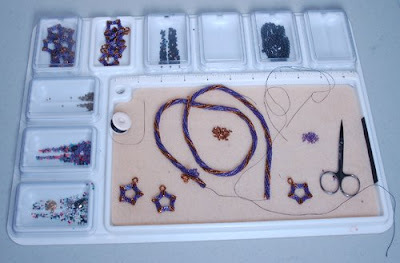 I worked on it at the Dallas Bead Society meeting on Saturday. I can't wait to add all the little stars to the ends. It's like the reward for working on such a long rope!